This is my first experience with Sashiko. I found it relaxing and fun. Sashiko is a type of embroidery stitching from Japan. It uses a running stitch. 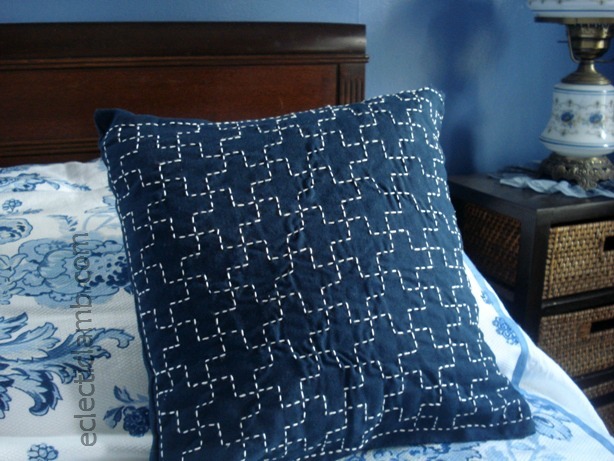 In 2011 I took a Sashiko class at the City Quilter in Manhattan. At that time I purchased a kit and started this piece. I completed the Sashiko stitching shortly after the class. But I did not sew it into a pillow until yesterday. One of the great results of having a blog is that it encourages me to complete projects. This entry was posted in Crafts, Embroidery and tagged sashiko. Bookmark the permalink. Thank you. I took the photo in my blue guest room. Sashiko is fun to try. The kit I tried came with a printed side and blank extra material to make into a pillow, bag, or whatever. I agree with you about blogging and finishing projects. When I blogged, I always felt pressed to finish projects and photograph and write about them. Since I abandoned my blogging, unfinished things do pile up. The up side is that I experiment more and spend time chasing down interesting stitchery than I used to. I seem to take more risks, now. Some work, some don’t, but at least I tried! And I LOVE your pillow! Thank you so much! Thanks for sharing your blogging experience. I tend not to do things that I won’t put on my blog for whatever reason. So those things take longer to complete or don’t happen. This is beautiful Kathy! Amazing how simple lines can turn it into a piece of art! Thank you Winnie! I agree. Its a beautiful pillow. Must really need time to do those embroidery on it. Great job! Thank you. The stitching went quick – running stitch and load the long needle. It was the procrastinating of sewing it into a pillow that took time. Awesome! Beautiful, neat work! I agree with you about blogging and finishing things. I am a heap of lazy bones and blogging makes me move it around. Good job! Keep motivated! Expecting more finished projects! Thank you so much! Now I need to think up which unfinished projects I want to showcase on my blog. Once again I will say this: you are so damned creative and I love it! Beautiful work – I admire your patience! I love Sashiko, too. It is very meditative, since the stitch is easy, but the result is so clear and uncluttered. Same as you, I purchased a kit (from “Purl of Soho”) a couple years ago and made a pillow. Good beginner’s project! Have you posted about Sashiko projects? I just did a search on your blog but could not find any quickly. I have another kit to try that a friend sent from Japan. It is a for a wallet but it does not come with the plastic sleeves to hold cards and I have been unable to find them. No, that was before my blogging days. I tried to think where you could find the plastic sleeves…I went to a sewing and quilting show recently where one company sold a lot of Sashiko kits and such, but of course I didn’t keep their card. If I can think of anything I will let you know. That is awesome, very pretty! very cool. you did very well on this one. it looks flawless in the picture.